What can happen in a chance encounter? Something happened today that make me stop and think. It could have been the date, maybe the topic, or perhaps a conversation last night. A man walked into the store and was buying donuts.We had a brief exchange and I said "put a red heart on the bag and buy a card" He shrugged and chuckled a little as he said, "I'm not into buying cards." I didn't respond, and maybe I should have, and I might have had company pondering the thought. You see, last night a friend was telling about a book The 5 Love Languages: The Secret to Love that Lasts by Gary Chapman. You feel most cared for when your partner is open and expressive in telling you how terrific they think you are, how much they value or respect you, etc. Then this is your love language if you most loved when your partner offers to give you a break from some task so you can do something you enjoy. This love language is just as it sounds. A warm hug, a kiss, touch, and sexual intimacy make you feel most loved. Do you most respond when you and your partner are fully present and engaged no matter how insignificant the activity? Your partner taking the time to give you a gift can make you feel appreciated. My thought as it relates to the conversation this morning was "I wonder if his wife likes receiving cards?" She may be used to his behavior, and it's not relationship ending either way. However, it seems to me, and maybe you agree, it could genuinely strengthen a relationship if we took the time to put some thought into these things and who our love in ways our Valentine can most appreciate. With that, you too can ponder. 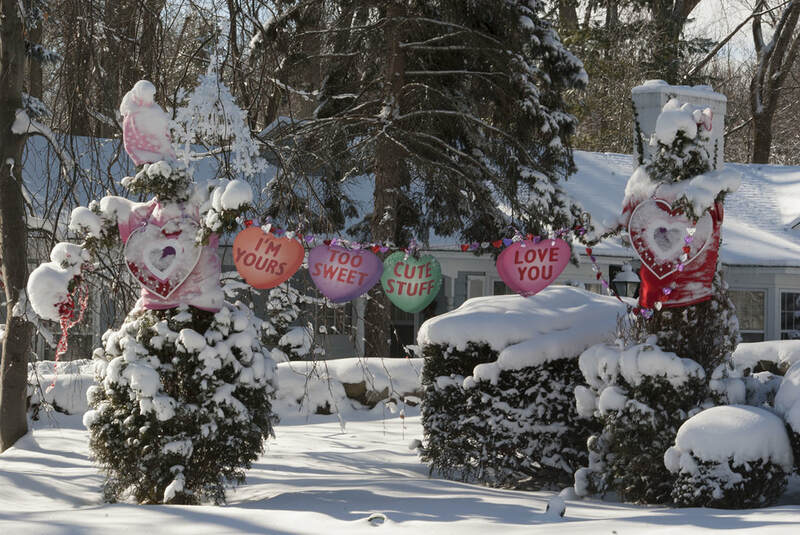 Have a beautiful Valentines day. The calendar says it's fall, but the temps disagree. Buckle up folks ready or not it's officially fall today but take a drive or walk and you may also be confused. You will see some signs of fall yet be sweating profusely it is hot outside; it is also beautiful. Life in Michigan has a way of keeping us confused and on our toes. Get out and about it's a good way to maintain the body and mind healthy! Peaceful, beautiful, and I am grateful I can walk and get out and about. I am also grateful for nature's beauty that surrounds me. One woman told me "no way, it's too hot, are you crazy?" The truth is mornings and evenings have been very comfortable temps. Enjoy now before well; you know what comes next. You don't have to be in great shape for a nice stroll and beautiful scenery. Each step is a step toward your mental and physical health. Just about anywhere you can see some beauty. One place I finally explored a few years ago is the Heritage Nature Trail between Kenwood park and The Carl T Johnson Hunting and Fishing Center. It's a leisurely stroll or more intense if that is your style but for me, this time is more a casual exploring than a physical workout. Woodland trail, water, a raised lookout for the more expansive view all lend themselves to a peaceful stroll. This week I saw a turtle, frog, duck and yes, the beginning of fall color. Most of us think of those beautiful sweeping vistas of color when we think of fall. I have found just a snippet of color, much like a moment in time, a beautiful splash of beauty and memorable point. Early fall offers just those snippets to whet your appetite and soothe your mind before that final peak arrives. It is true, life in Michigan has a way of keeping us confused and on our toes. Get out and about this weekend and explore natures glorious bounty. 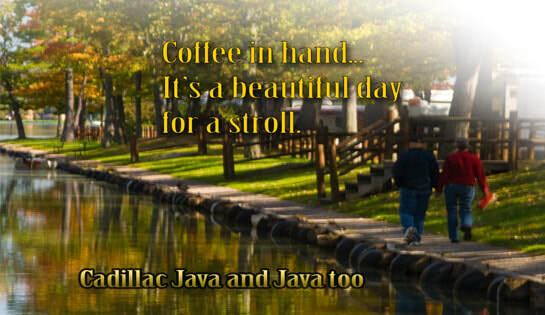 Grab your Java and get on out and about. We are going to have some amazing weather this weekend. 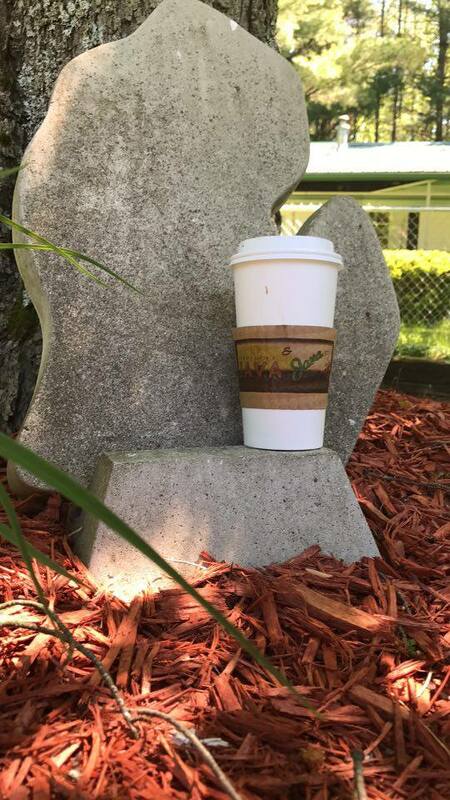 Grab some Java, go to the beach, don't forget to take a picture of you and your java at the lake, and then click here post it on Cadillac Java facebook page! Cooler temps and cloudy skies feels like summer is waning, Where did the summer go? Way too fast is all I know. All the signs are right in front of me it is real summer is fading. The garden harvest is growing. Filling the pantry with fresh garden produce is a sure sign summer is coming to a close. Don't peek around that corner oh - I warned you don't look around that corner- it's already back to school time. I've never been a fan of school and whether my year of kindergarten set the stage or was just a predictor of things to come is uncertain. We lived about two blocks from the school. My mother had to walk me every day of kindergarten with me crying all the way. I went to pre-school the year before so it wasn't like I had never been away from home. But there was something I didn't like. Just one of the many headaches I caused my mother over the years. Ah yes, it's true the role of a child! One day when we arrived at School my mom said to my teacher, Mrs. Bedell, what a hard time it was getting me to school. Mrs. Bedell responded "you would never know it once she gets here." You'd be glad to know my mother survived which is good because I wouldn't know about this story and other if she hadn't causally told me one day. I love to learn but never really did learn to like school. Find out more in the community calendar by clicking here! 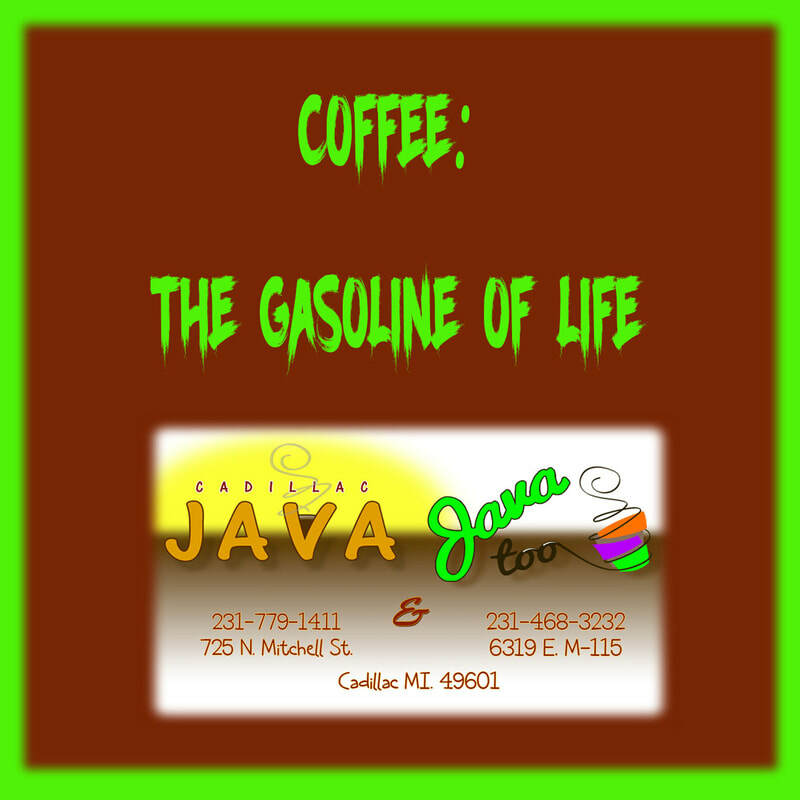 Be sure to stop by our sponsor Cadillac Java or Java Too and fuel up while you're out and about. What happens when you throw two separate thoughts together? Throwing two disconnected thoughts together could be chaos or a whole lot of fun, you decide. Hockey, you know the sport that loves a good fight-the rougher the better. A musical, song, dance and a story for their entertainment and fun. What do they have in common? Nothing! Or so I thought anyway. Then someone comes a long and messes with our world by putting these together. 'Hockey — The Musical!' "The funniest, bawdiest, skate-tapping musical ever!" Some things in life just don't make sense. But it's always time to get out and have some fun. A bit outside of Cadillac this time but looks like so much fun. Unfortunately, I can't make it this week, but I am curious. If you get to Traverse City to see this, I would love to hear your review. Dance or skate on over to Cadillac Java. Sip a latté with a friend and chat about hockey, musicals or just about anything. 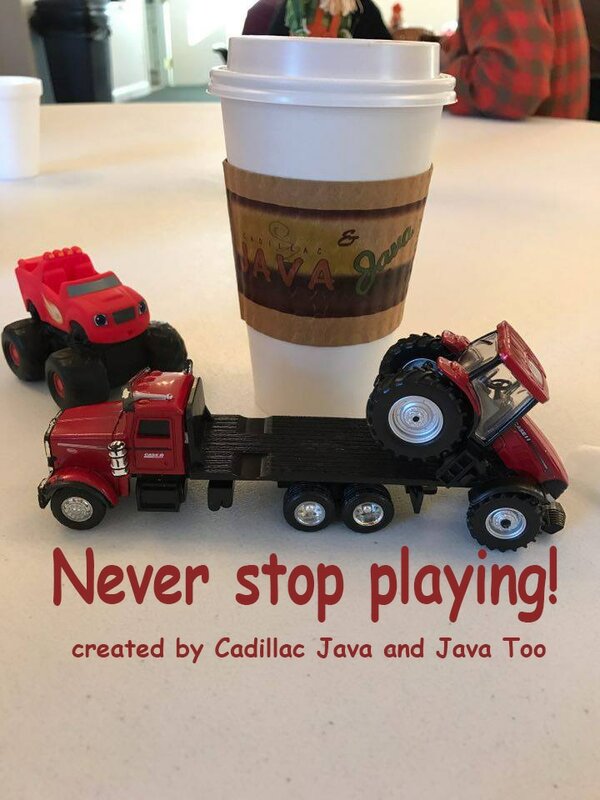 It's time for a get-together, and Cadillac Java is a good place to start. 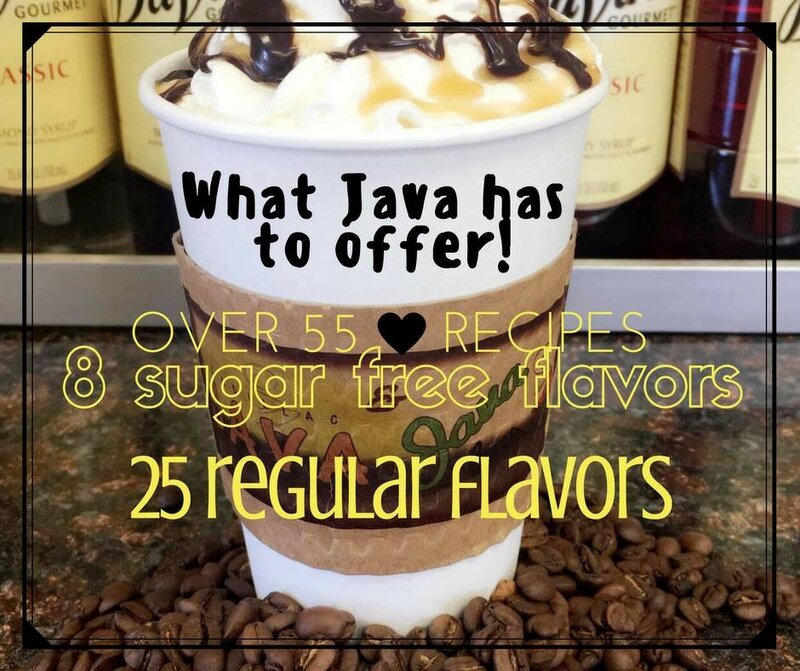 Cadillac Java and Java Too ... your locally owned specialty drive-thru coffee shop offering fresh espresso, premium coffees as well as frozen, iced and blended drinks. Click the photo below for our website or go to cadillacjava.com for more info and directions. It's nice to see some things never change. A stroll at Mitchell State park told the story. Along the beach boats headed out off the ramp, people fishing off the dock the time is today, but it could be 20, 50 70 years ago too. I watched an older couple sitting quietly, patiently in their chairs each with a line in the water...waiting. A short distance down the walk a boy, about eight years old, pole bend fighting the big one while his dad stood by, not so patiently; you could see dad desperately wanting to help but knowing it is best if he doesn't. Boats trolling through the canal and people like me just out walking and enjoying the beautiful evening. What started out as a quiet night became waves of memories crashing in, the fish my dad caught, the fish my brother and I caught. The time my brother and I were about seven and ten years old. We went out in the row boat by ourselves exploring the lake. We could see it, a smaller pond of the quiet lake and as we rowed closer, we could see the little lily pad covered channel connecting the lake and pond. Anticipation grew as we started working our way through that channel to what we hoped was good fishing. That channel turned out to be quite shallow, full of lily pads and weeds. We weren't allowed to use the motor yet which was probably a good thing; that row boat would have been a stuck mess. Scraping along the surface of the bottom pushing with the paddles we made it through to the pond. The fish were hitting so fast and hard when a line hit the water we had a fish. It was non-stop madness of dropping a line, taking a fish off and putting a worm on a hook over and over again. What a crazy day in a tucked away oasis and the starving crowd below the surface of the water! 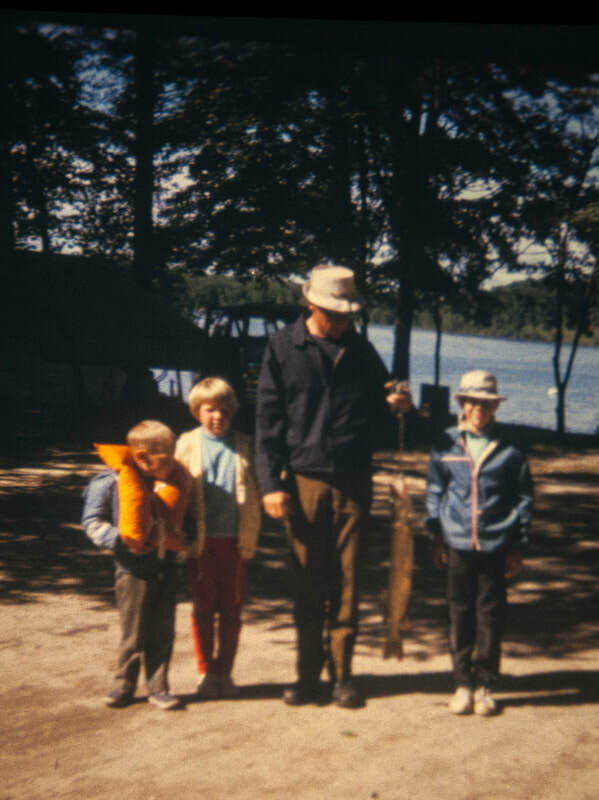 I don't know how many fish we caught that day; bluegill, sunfish, perch- I think we could have fed the entire campground that night. Couples or kids; boats or shoreline; lakes, rivers or streams. It doesn't matter what kind of fishing you do there are plenty of lakes, rivers, and streams to drop a line in the water out and about Cadillac. Plenty of memories to create, relationships to build, and plenty of stories to share. Get on out to a lake, river or stream and fish up some dinner and stories. Or take a stroll along the shore and enjoy watching the action. Continue to share your stories they are the bridge between generations and the fabric pieces that make a beautiful, cozy warm quilt of life. 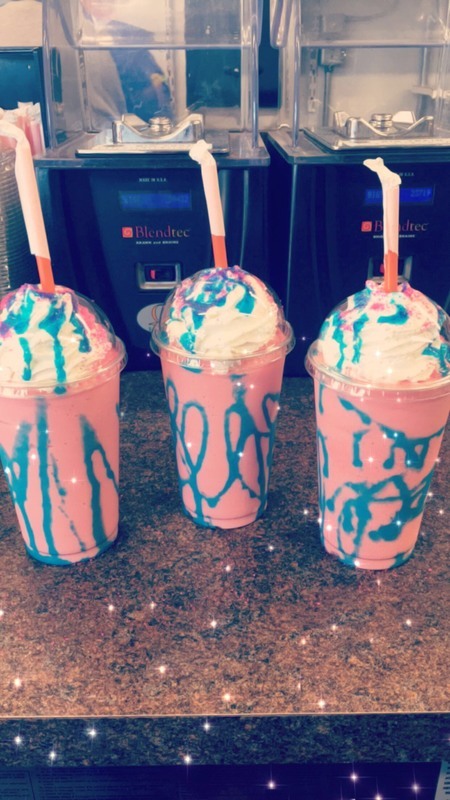 What's mango creamsicle with Raspberry Flavoring and blue raspberry drizzle? The Mermaid Cremesicle! The perfect cooling drink for a hot day! Support our sponsor. 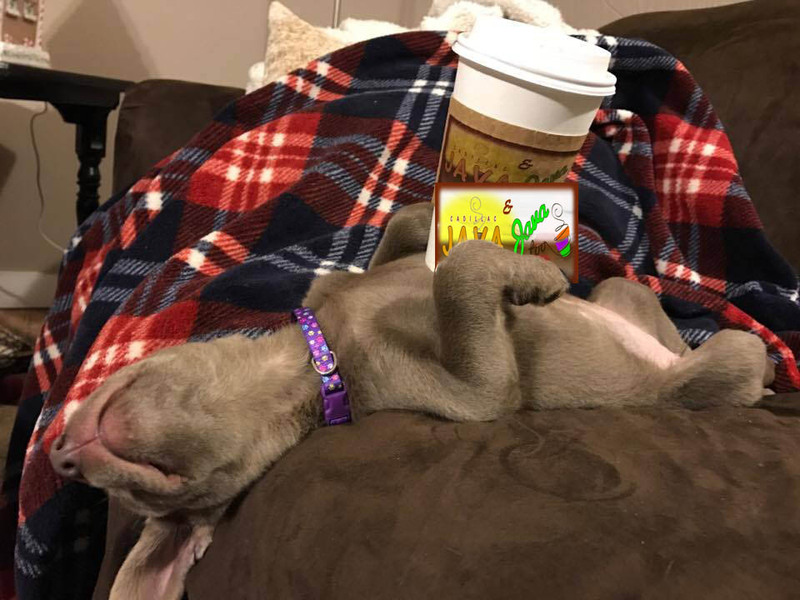 Head on over to Cadillac Java or Java Too to get yours today. But hurry, it's only available thru July 31st! We were watching some old family movies the other night. These were only 20-25 years old, but one thing stood out that I believe we are all miss even with all the exciting things we have now. These movies were of my niece and nephews, and I know they would have had similar movies of my brothers and me. I think it's a common belief among new parents and grandparents that kids need more toys and things. Watch a child open a gift, discard the toy and play with the box. Or open a cupboard, and watch children spend seemingly endless time playing with simple pots and pans without getting bored. Give a child a small chair or stool, and they will climb in and out of it learning how, getting better and entertaining themselves. I've experienced three generations of this, and it is the same story through all three. Faster, easier and high-tech might be fun and exciting, but for a deep, satisfying fulfillment, in my mind, simple wins hands down. It's the same idea with Classic Cars; working on them was easier. You hear the old cars were fast or the mostly unspoken comment because the hot cars got the hot girls. I know they like classic cars because of the ability and satisfaction of doing the work themselves. I think we can all agree, much like these old movies, the old cars bring us back to simpler times and fun. On your next cruise through town stop by our sponsor and fuel up! Have you ever gone to the store only to get home and forgot the one item you went to get? That's similar to what happened to me last week when I wrote my post. My first inspiration was one story that made me smile, imagine and remember. Last week I shared about a book I read from a local author. Ironwood Roots: Memories of the Upper Peninsula by Betty Warren Best, a long time resident of Cadillac, MI, published by Best Gearhart Knitting Machines. Available on Amazon. The story that vanished lost along the way was her families journey in 1938 from Ironwood to Flint in expectation of seeing relatives. That drive included a ferry ride across to the lower peninsula. Travel changed with the Mackinaw bridge erected in 1956/57. Reading about Betty's experience made me smile but also recognize what an impact the bridge was for many people and all our lives since. Imagine in the haste of planning a trip to make sure you got to the ferry on time. And then, as Betty writes, "at this rate we would be lucky to get on the last ferry of the day. And meanwhile, we had a long, long wait in our car without access to water, a bathroom, or a place to walk. Just a spot on the tarmac in the hot sun". Aren't you glad those days are gone? Why I look back. I don't want to live in the past. But upon reflection, I see what happened, what people went through and I see hope because of what followed. I step back and look at my grandparent's lives. They were a young married couple with four kids when the depression hit. Another child born during the depression and another toward the end of it. The values and beliefs from that experience stay with a person, at least part of it. Only part because when you also look at what came out of the depression, it was quite the opposite. We became people who saved everything because somewhere along the way you could use it again and have also become a throwaway society. Not everything is good yet, the human desire for more and the innovation and vision to make it happen you see all around us today. I've had my feet knocked out from under me and smacked the ground. No, it isn't fun just as I am sure going through the depression wasn't fun. As Betty Warren Best reasoned in Ironwood, "it's what we knew." She came from a child's perspective. For me, as an adult, it wasn't all I knew, so I rely on vision, hope and mostly what have I learned to move forward. I remember my mom telling about her family crossing to the Upper Peninsula by ferry when she was growing up. It was hard to imagine the bridge didn't stand sturdy and proud connecting the Upper and Lower Peninsula's because in my life it always had and we crossed it many times. The bridge is a good metaphor for what has been and a reminder of what could be if we dare dream and take the steps across. A bridge across time on this Mother's day weekend. A thank you to Betty Warren Best for sharing her stories. A tribute to my mom for your inspiration. To my grandmother and great-grandmother and all those before because just like the pieces of fabric in your quilt on my bed, you are a part of who I am. And may the bridge continue, even though I don't have children, to others along my journey. Some of my flowers. The same kind as my great-=grandmother and I believe grandmother have in their garden. Interesting I've grown these for about 5 years and just saw these 2 pictures last year. If you are stumped what to get your mother this Mother's day a gift card to Cadillac Java and this book may be the perfect gem. Give your mom the break she deserves this year with a gift card and Ironwood Roots. It's not just about Ironwood it's about life. "We were aware, of course, that this was gross mutiny against mom's rule, but"
Even a compliant, respectful child has that moment when they know better but just have to do it anyway. Such was the case when Betty and her sister get their first cat. Just one of the many stories Betty Warren Best shares in her new book Ironwood Roots; Memories of the Upper Peninsula. Born in 1928 in Ironwood, Michigan Betty and has been a long-time resident of Cadillac. Born just a year before the great depression Betty experienced life in rural Northern Michigan through the great depression and World War ll. Betty embraces you in the story with the innocence, wonder, and delight of a child written with the maturity of time. Full of childhood antics, love and loss I found this book warm, enchanting and full of engaging detail. You may remember living through the depression, WWll or hard times or heard stories from your parents or grandparents. For those who haven't these stories will give insight to how your parents, grandparents or great-grandparents lived and the experiences that shaped their lives. In an entertaining way we learn about life because the situation, time and people may change the emotions are similar. I don't have memories of many family stories, and through these tales, I felt like my grandmother sharing her life. Thank you, Betty Warren Best for making me smile and laugh in wonder and amazement at life long before I was born. For giving me such a delightful depiction of family and life in a rural Northern Michigan town and beyond. I grew up knowing my grandparents. We saw them regularly so to me, who was shy and wary, to be seven years old and meeting my grandpa for the first time seems unimaginable. Here was grandpa's first visit full of life, loving, spirited and captivating. Take a drive to "little girl's point" on the shores of Lake Superior or a family trip across the water to the lower peninsula or the importance of the sewing machine. The humor of life thru a child's adoration for Shirley Temple to the sadness of loss these stories will entertain and enchant you. Drive thru Java, settle in and delight in the stories Betty has so graciously shared. The Cadillac Rotary club continues to improve the lake shore. When I was growing up in the 60's, and 70's I loved Lake Cadillac. Playing in the water, out on a boat, or just hanging out by the water are very fond memories and I immediately relax. In fact, the water is the first place I go when I'm stressed out. In my 20's I was amazed the lake down by the city park seemed so underutilized and drab. The shore along Chestnut and Lake Streets were just a patch of grass. The only time I remember that stretch used was for a water show in the summer and 4th of July for the fireworks. And, of course, I did nothing but wonder. Fortunately, someone did more than wonder and instigated the pathway along the shore. The Keith McKellop pathway is used by people at all times of the day enjoying a bike ride, a run or a quiet stroll by the lake. That set the vision for others to create a playground, the sound garden, restrooms and the Rotary Pavilion. On the other side of the City Park a splash pad and skate rink in the Cadillac Commons that opened last year. Currently being built is the market behind the theater. All this to add vitality to the downtown area. Now, someone has expanded that vision by adding another feature the White Pine Trailhead on the corner of West Chapin and Lake Street. The new trailhead will include parking, an information kiosk, bike racks, drinking fountain, a picnic shelter and a bike share station with the goal of bringing people here as a destination to start their ride on the White Pine Trails. I love seeing the improvements along that lake. I still enjoy playing in the water, heading out in a kayak or just looking out at the water relaxing after a stressful day. And, my favorite part is finding creative ways to pay for these improvements. Instead of complaining or expecting the city to pay using tax-payer money the Cadillac Rotary Club is using a fundraiser. The fundraiser will be a live and silent auction of donated items. This year’s big ticket item is a boat donated by Rec. Boats Holdings Tickets are $25.00 each. You need not be present to win. The auction is Friday, April 28, 2017, from 6:00 pm to 10:00 pm at the Cherry Grove Event Center. You can purchase tickets here. fresh starts, and an entire day ahead. A reminder, you're invited to sign up for our exclusive email specials click here and start saving money.